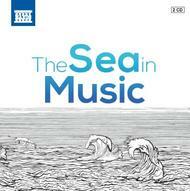 Composers have been inspired by the sea for centuries. For some, the stimulus is the sea’s volatility and power to destroy, whilst for others it’s the rhythmic and colouristic opportunities that allow them to paint pictures in sound. These composers take us on journeys both actual and metaphorical, discovering immensity and stillness, and hinting at mystery, and the unknowable chasms between the world of the human and the world of watery nature.